Tweet Up front I want to say that I’m a fan of Mike Portnoy and Steve Morse. They are two of my favorite musicians of all time. With that said I’m not a huge Transatlantic (A side project/band with Mike Portnoy and several members from the prog community including Neal Morse) fan, not because they weren’t good, but because it was over my head and I spent enough time trying to figure Dream Theater out. So before I get criticized for being a Mike Portnoy fan boy (especially since I gave Adrenaline Mob such a rave review), I wanted to say that if I didn’t like it, I’d say I didn’t like it. 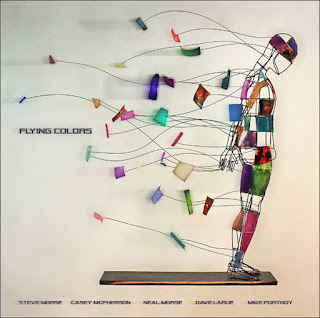 That said, I absolutely love the debut album from Flying Colors. The band is made up of Mike Portnoy (Adrenaline Mob, Ex-Dream Theater), Steve Morse (Dixie Dregs, Deep Purple), Neal Morse (Spock’s Beard, Transatlantic), Casey McPherson, and Dave LaRue (Dixie Dregs). In my opinion Flying Colors is what pop music should be. It’s hard to compare Flying Colors to anything else. My best attempt at it would be Coldplay meets Queen meets 80’s era Genesis and Yes. When you combine Mike Portnoy, Steve Morse, Neal Morse and Dave LaRue (or any combination of those guys) you’re going to get high quality musicianship. What I didn’t expect to get was an album with songs as accessible as these are. I expected the diversity on the album, but I also expected a lot of these songs to be over my head. There is a song on the album that is three minutes and twenty seconds long, and then there is another song on the album that is twelve minutes long. “Flying Colors” could have existed in the seventies, eighties, now or any era in between. I’m thirty-two years old yet my sixty year old dad can get into Flying Colors just as much as I can. You always hear about legendary bands picking up younger fans over the years, but this is a new band that is capable of grabbing fans both young and old. I can’t go through the album track by track, because the songs are so diverse it would take me an extra 10,000 words to get through it. I really think that Flying Colors could take off, especially if they got on the right tour. I would actually go to a Coldplay or U2 concert if Flying Colors were opening. It’s not every day you get an album full of smart songs that are still accessible. If you’re a fan of musicianship then this is a must pick up. If you’re into any of the bands that these guys have been a part of then this is a must. If you’re into the prog rock bands of the seventies that started playing more popular music in the 80’s then this is a must. Flying Colors will definitely be on my top 10 list of 2012.